Product code: W346 Categories: Sold Items, Sold Pocket watches. J. Hargreaves and Co was founded in 1797 and here we have a magnificent antique pocket watch from them that is in superb condition. 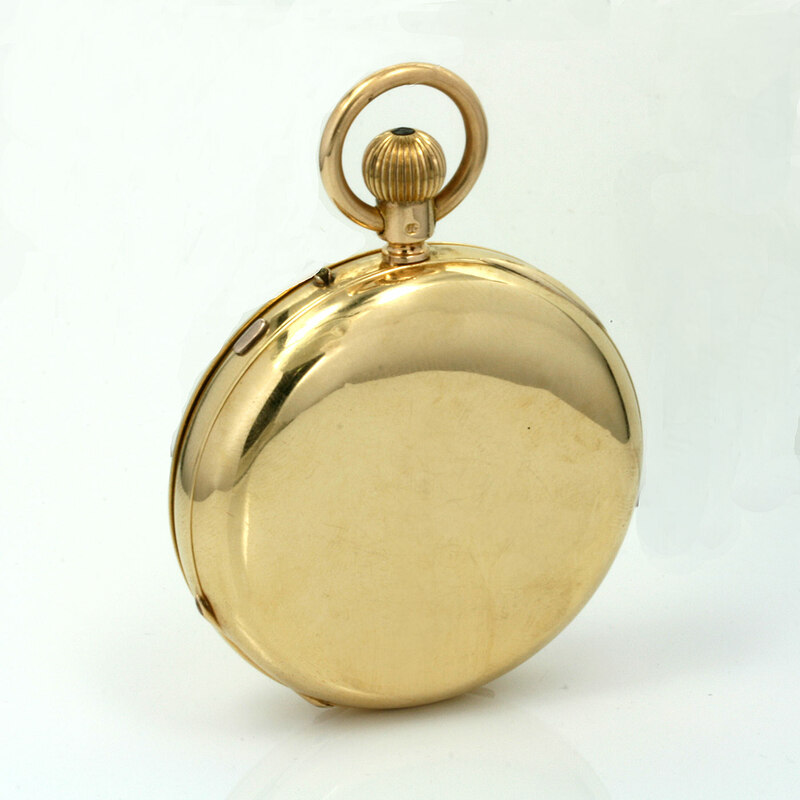 This prestigious watchmaking company was so highly regarded that they made pocket watches for the royal family. Made in 18ct yellow gold, this gents full hunter pocket watch has its original white enamel dial with black Roman numerals and centre stop watch seconds counter. The pocket watch is wound via the crown and the time is set by pressing in the pin to the side of the bow near the 3 o’clock position then turning the crown. Then near the 4 o’clock position is a slide bar that when slid will start and stop the centre sweep seconds. Measuring 54mm across by 77mm from the bottom to the top of the bow, this pocket watch also weighs in at a hefty 141.6 grams making it feel so solid in the palm of your hand. Regardless of the fact that this pocket watch is over 125 years old, we have just had it completely serviced and it runs beautifully and comes with our 12 month warranty. There is nothing quite like a genuine antique pocket watch to hold and admire and this one is just incredible for its age and condition and history.